GM Garth Snow's Plan, Has He Really Learned Anything? 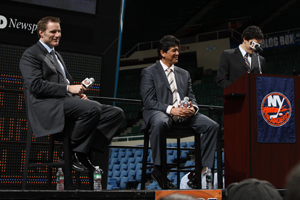 I remembered this from April 2008, the Islanders website still has a link to it. "Average is as close to the top as it is to the bottom, and I'm sick of being average," said Snow. "We've developed a strategy to become competitive every year, which is the key to winning the Stanley Cup. It's called "The Plan." And it involved three parts: drafting wisely, developing prospects and sprinkling in free agents. We're putting in all the resources to bringing home a Stanley Cup. We need you the fans to help make this happen. We want you to continue to be the great fans that you are and we'll make this happen together." Snow was asked about his working relationship with Nolan. "I think it's good," said Snow, smiling to Nolan before answering seriously. "We have a great working relationship. The key is communication and we communicate on a daily basis. I get taken aback when I get asked that question." Since that interesting evening, we have see our GM keep referring to one part of his quotes, while the other part may have been true about daily communication, but absolutely did not prove out to be a great working relationship. Bottom line is I have no problem with Garth Snow not speaking or being guarded when he does. Many general managers/owners rarely speak and it's also usually guarded at best. Having written this, if he decides to say something definitive it has to be honest or don't waste our time. If he wants to interview and be cryptic in responses that is also fine. Since that day Snow has kept to his words about his plan, no doubt folks would have liked him to go heavier on the sprinkles, but on the ice his team has been sidetracked severely by injuries. I would also suspect we will see by action if the Atlantic Division's longest tenured coach does have a good working relationship with his boss. For those scoring at home this was the opening night lineup for game one of the Snow-Gordon era at New Jersey in 2008, many others injured/scratched that night or backups are long gone. Many will recall that was Jon Sim's first game after almost a full seasons absence and the start of a nightmare season that produced 582 man games lost, after league leading 402 in 2007-08. Brendan Witt played 65 games (-34) on guts with knee problems, Kyle Okposo also played 65 games but to call him completely healthy missing seventeen games is pushing it. Frans Nielsen played hurt into 2009-10 for his 55 games that season which also concluded Mike Sillinger's career. Mike Comrie to this day has not proven durable. Hillen/Comeau saw a large part of 08-09 in Bridgeport. 2009-10 saw man games drop to 250+ and 21st overall in the NHL which by this teams post-lockout numbers was a dramatic improvement, but indicates an underlying problem that has yet to be solved which goes well beyond only Rick DiPietro. This will be the year we start to get some hard answers about Garth Snow's plan unless the injuries start piling up early and often again. No gang, he get's a full pass on Rechlicz, Hennigar minor signings that obviously did not pan out, his early contract to Brendan Witt did not pay off, but also no criticism to lock up a character veteran. The trades of Mike Milbury's former first rounders in Nokelainen, Nilsson and Ryan O'Marra have not proven to be bad decisions, it remains to be seen if Garth Snow's Islanders got the most out of Jeff Tambellini and former Milbury selection, Sean Bergenheim. For what's it's worth Snow likely could have sprinkled in Guerin, Comrie, Satan or Richard Park by now if he wanted to sign them, along with some others. That to me would be a clear sign Snow is not sticking to his plan. If Hilbert or Sim beat out some prospect at this point it's fair to say his plan is failing in some significant spots also. As I have written often, I see trades coming and moves made which may go right down to opening night.